Richard Irwin (Belper, United Kingdom) on 5 January 2008 in Plant & Nature. Old dead leaves gathering ice on the patio. that is a very pretty one. the details are nice. Wonderful work as usual Richard! Fantastic shot!I love colors here! Great colours, a very lovely shot. 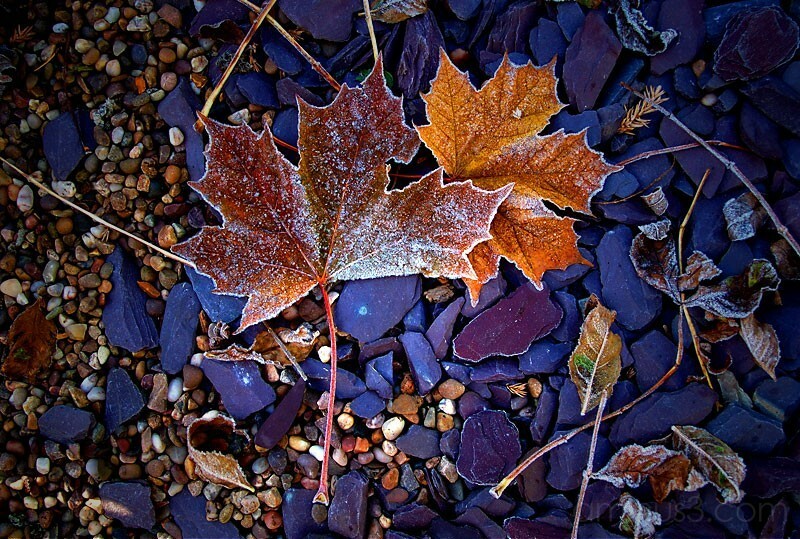 A lovely composition of stones and leaves. Beautiful colors. The iced leaves seems to shine indeed !!! Perfect capture of the frozen leaves! great highlight and shadow detail... the purplish glow is terrific! have u increased saturation or used highlights?! good un! Special colours in this composition and the contrasts turn it elegant! wow..dramatic colors and contrast..perfection ! Lovely shot and fantastic colours! Fantastic colors! We hope the leaves will survive. the colors are indeed masterful, I especially like the different shades of the leaves. Those leaves are awesome looking!! :) Did you place them there or where they just there? Cool shot! @HorseRotorVator: These ones were just there luckily. Beautiful. Love the sharpness and contrasting colours. Somehow a very beautiful image. The contrast of textures and colour is just outstanding. What the heck, I may as well add my agreement with all of this praise. Beautiful, beautiful, beautiful.